Detectives investigating the death of a war hero beaten up by burglars today released CCTV images of two potential suspects. The men were caught on camera apparently attempting to break into another house nearby on the evening that 98-year-old Peter Gouldstone was attacked in his bed. The Second World War veteran suffered a head injury and bruising in the assault in north London on November 5 last year. The raiders escaped with an eight-year-old TV worth just £10. Mr Gouldstone, who had lived in the house for 60 years, was taken to hospital where he died a few weeks later. Today detectives released CCTV images of an attempted break-in in a neighbouring street to Mr Gouldstone’s address in Evesham Road, Enfield. 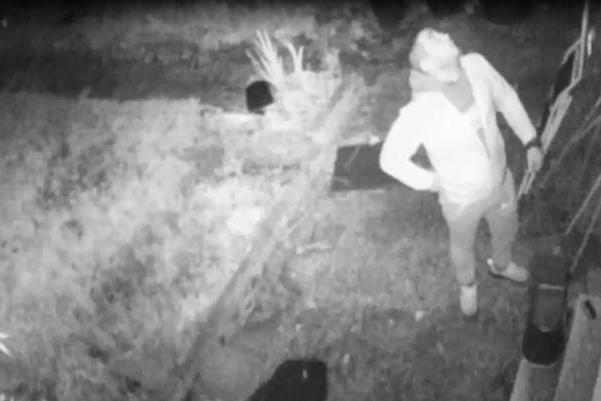 The CCTV footage shows the men enter a back garden and peer through windows before trying to open the doors. They left empty-handed. Detective Inspector Alison Cole, of the Met’s homicide squad, said: “We believe there were at least three men involved in this attempted burglary and we are very keen to speak to them. “I cannot categorically say they are the same people who burgled Peter Gouldstone’s house but we need to identify them to see if they can help us with this inquiry or if nothing else to exclude them. “They are potential suspects in our inquiry. She added that Crimestoppers had issued a £10,000 reward for anyone who could provide information leading to a conviction. The case is still being treated as manslaughter because the exact cause of Mr Gouldstone’s death has yet to be determined. The first attempted break-in took place at around 8.25pm. Police believe Mr Gouldstone went to bed as usual at around 9pm before he was attacked. He was found lying battered and bruised in his pyjamas on his bedroom floor by his son the following morning. Detectives said the level of violence meted out in the ‘brutal and senseless attack’ was ‘completely excessive’. Mr Gouldstone served in the Royal Corps of Signals during the Second World War and was mentioned in despatches for his bravery while fighting in Italy in August 1944. He became a Post Office telephone engineer after the war and retired 38 years ago. His wife of 65 years, Joan, died several years ago. Anyone with information concerning this incident should call contact police on 020 8345 3715 or call Crimestoppers anonymously on 0800 555 111.